I’ve never been as afraid to read a book as I am this one. I’ve also rarely been as desperate to. Maybe that’s why I ignored its release for a couple of months, and even then only checked it out of the library instead of buying it the moment I could. It just sits there on my kitchen table. Its cover is brightly colored. It’s barely 100 pages; I could knock it out in 20 or 30 minutes, easy. I stepped foot into the children’s section of the library to procure it, bracing my ears against the shrill cries and weaving around the tiny beings that barreled in my direction on the way to gawk at the fish tank. I braved the wasteland, that spine-tingling wing in the depths of the library, “here there be drool and sticky fingers,” and returned, triumphant, with my prize. Now I’m afraid to even open it. What could it possibly be? Earwig and the Witch, by Diana Wynne Jones. The last true story she wrote before passing away in March 2011. Maybe you haven’t heard of her, don’t understand why I’d whisper a word like “earwig” with such reverent tones. 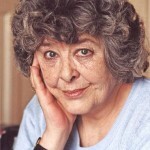 If that’s the case, know this: Diana Wynne Jones is one of the most under-appreciated authors in British fantasy. She wrote for decades before her death and produced an inspiring amount of imaginative fiction for children, teens, and adults. Go to the library and check out the novel Howl’s Moving Castle. If the name rings a bell that’s because you’re familiar with the work of one of Diana’s fans, Hayao Miyazaki. You’ll love it. If you don’t trust me, trust the words of another Diana fan, Neil Gaiman. The way I’m writing about Diana you’d think she helped raise me, that I hid in the woods and stretched her books over my knees on long summer days. That’s not true; I didn’t encounter her until college, and to this day I mourn all the years I never knew her. So it’s just impossible for me to approach Earwig objectively; to me it’s so much more than a 100-paged children’s chapter book. When taken just for what it is, however, the book is still a charmer. Its title character has the proper name of Erica Wigg, but she goes by Earwig because she knows that’s her true name. It suits her very strong personality better anyway. She lives at an orphanage, but don’t pity her, she loves it there. Due to her strong personality Earwig basically runs the place; she gets what she wants when she wants it, from the other children as well as from the staff. 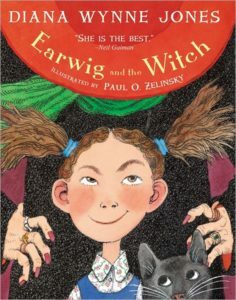 Earwig’s tricks don’t work on a strange couple who come to foster her: the woman is clearly a witch, and the man, well, he definitely doesn’t look right when Earwig peers at him from the corner of her eye. She finds she doesn’t want to learn more about him, either. The witch, named Bella Yaga, takes Earwig into her home to serve as her assistant. 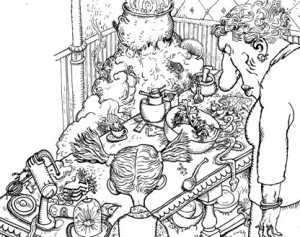 What that really means is that it’s Earwig’s duty to cook and clean and run about fetching things, so the witch can focus on her magic, which she has no intention of teaching Earwig. Earwig can’t manipulate Bella Yaga, and she’s certainly planning to stay out of the way of the man, called The Mandrake. Such is the surprise of Diana’s crafty writing that you don’t find Earwig a brat, you’re somewhat charmed by her as well, or are at least inclined to let her be. 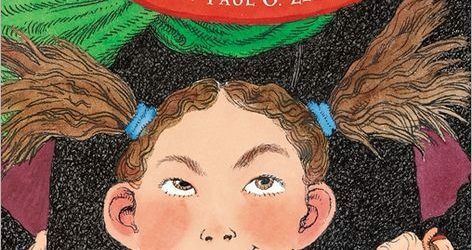 It’s in part the situation; Earwig might be used to getting her way, but it’s also right that a child shouldn’t be effectively enslaved by a witch. You root for Earwig to eventually wrap both Witch and Mandrake around her thumb. We learn little else about Earwig’s parentage. We know she must have inherited her propensity for magic from her mother, but that’s about it. This flies directly in contrast to a major criticism I’ve often heard about Diana Wynne Jones: her books end too quickly and too neatly. If that were the case Earwig would be living happily with her mother at the end of the book, and she’s not (don’t worry, I actually didn’t spoil that much for you, the book barely gives a thought to Earwig’s mother). Sometimes life doesn’t wrap up perfectly. Not all mysteries are solved. But Earwig’s only just gotten to Bella Yaga’s house, she has her whole life ahead of her. I would rather see Earwig grow up and find her mother, possibly even rescue her, than have her mother show up on Bella Yaga’s doorstep to save her. Because Earwig’s a child perhaps that latter option is more appropriate, but the former would make for a much better story. Thanks to the mysteries Diana Wynne Jones leaves in her stories, I have the option to imagine any number of exciting possibilities for Earwig, all while still getting to enjoy the wonderful one Diana left us. If you’ve never read Diana Wynne Jones Earwig and the Witch isn’t the place to start, that’s Howl’s Moving Castle, mentioned above. Read Earwig to your kids, take it with you when you have to wait in the lobby at the doctor’s office (you’ll be able to finish it in the time you’re waiting and it’ll make the time fly), savor the story that is at once both simple and complex. Diana might not have left us with a crowning achievement, a grand opus. Instead she tells for her final story a short tale of being stalwart and clever in the face of adversity, one that reveres the open possibilities of the life still ahead of us. That’s actually a beautiful message on which to end. Thank you, Diana. You were a treasure. Sallyo – I agree, at first I was really sad that Diana’s last book was so short. I’ve come to terms with it more, though, and I think that Earwig and the Witch is actually a really sweet story on which to bow out. And I also agree that Fire & Hemlock doesn’t end neatly. Neither does Dogsbody (which, if you haven’t read, you really should, I love it. But then I love them all). So I don’t think those who criticize her for that know what they’re talking about. MJ – I agree, let’s only use the present tense. And it is hard to find her books; a lot of them are out of print here in the U.S. You know where I’ve had a lot of luck? Ebay. There are a lot of independent booksellers in England and other places that have had more recent editions printed, who are selling the books for cheap. I got Dogsbody for only $5 and it was Buy it Now, I didn’t even have to bid. Hopefully you can find some books where you are, there is also a book exchange website, bookmooch.com, that was founded to help share books with people who live in places where they have a hard time finding them. Good luck, and if you need any recommendations for more of her books to try, let me know! So Angela: now that you’ve finally READ the book (and given us an enticing article to go read it ourselves), I must ask you: do you now feel free to PURCHASE the book, so that your Diane Wynn Jones’ personal library will be complete? I can’t decide if I want to purchase it, because I don’t know how often I would read it, as much as I liked it. But I’d want to read it to my as-yet fictional future children, so I probably will in the long run. I’ve got some time because it’s new; I don’t have all of her books yet, my efforts right now have been focusing on tracking down some of her rarer books.